We will have more than 10,000 butterfly plants (both annuals and perennials), including seedlings of more than a dozen milkweed varieties. These plants are ideal for starting butterfly gardens or adding to established gardens. Monarch numbers have been declining and we need to plant milkweeds to sustain the monarch migration. A list of available plants appears below. 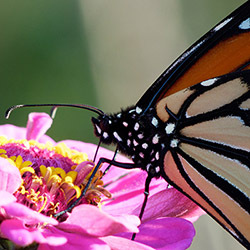 At the Open House you can learn about creating Monarch Waystations and see the magnificent butterfly and pollinator garden maintained by the Douglas County Master Gardeners. There will be games for the kids inside and out and they can make "seed balls" containing seeds of milkweeds and other butterfly plants that can be used to create habits for monarchs and other butterflies. They can also see lots of different insects and spiders, watch videos, or complete a variety of activities. All are welcome to tour our garden and lab space. We will have live demonstrations, and, of course, monarch butterflies! Refreshments will be provided. 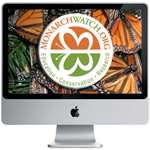 If you enjoy the various educational, conservation, and research programs Monarch Watch offers throughout the year, please consider making a donation today - it's quick, easy, secure, and fully tax-deductible. You can even set up a recurring gift (monthly or annually) if you'd like. We rely on contributions from Monarch Watchers just like you to keep the program going - thank you for your continued support! We are sharing photos and comments throughout the day via our Facebook page - you do not need a Facebook account to view the page, only if you you want to share your own photos or comments. Enjoy! Take West Lawrence exit and continue South on IOWA street. At the 19th Street stoplight turn right (west). At "T" turn left (south). Foley Hall is a one-story building on your right. Look for our Open House signs and/or parking attendants if you need directions. Park in designated parking areas. Take the Iowa Street/59 HWY exit north into Lawrence and continue north to 19th Street. At the 19th Street stoplight turn left (west). At "T" turn left (south). Foley Hall is a one-story building on your right. Look for our Open House signs and/or parking attendants if you need directions. Park in designated parking areas. All of the plants listed below would be excellent choices to use in creating your very own Monarch Waystation butterfly garden/habitat. The milkweeds are of course the host plant for monarch butterfly caterpillars and all of the plants are nectar sources for monarch butterflies and other wildlife. Once you have created your Monarch Waystation, be sure to have it certified by Monarch Watch so that your habitat will be included in our Monarch Waystation Registry - an online listing of habitats all over the globe! Plant list and availability - updated 22 March 2019; Good=20 or more plants, Limited=less than 20 plants, n/a=not available.